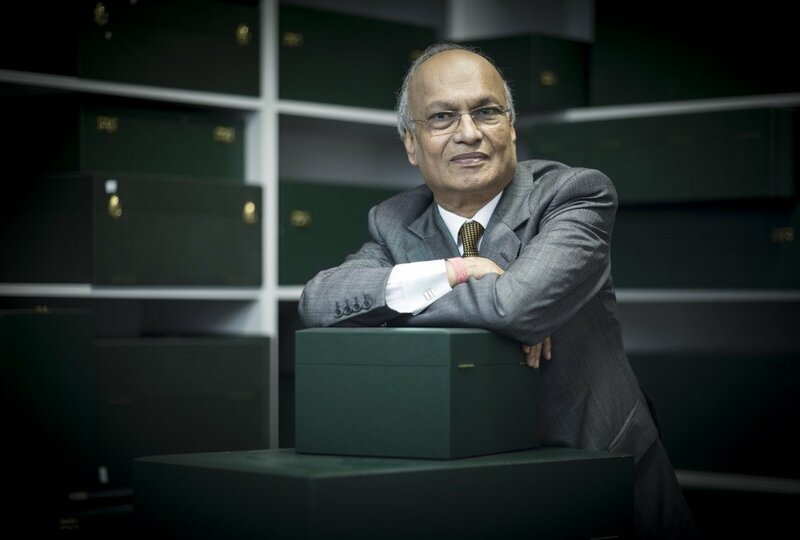 Nirmal Sethia is the founder of premium brand Newby Teas and the owner of the largest collection of rare and valuable tea-related artefacts in the world, including a teapot that once belonged to Admiral Nelson, a silver gilt monkey trinkspiel made in Germany circa 1600, a Fabergé silver and enamel tea caddy made in Russia, a tea service hand painted by artist Antoine Beranger, Theodore Roosevelt’s tea caddy as well as a few pieces designed by Sethia himself. He is a life-long philanthropist, whose eponymous foundation was established some 40 years ago to support charitable causes in India, launching formally as a UK-registered charity in 1995. An intriguing and charismatic man, Sethia is a vastly successful serial entrepreneur and collector, and a great raconteur. BBeyond’s art editor met with him to talk about tea, philanthropy and life. How do you select the causes you wish to fund? 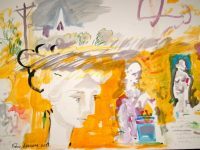 If you’ve been fortunate enough to accumulate wealth, you have a responsibility to give and you use your intuition to decide where your generosity would make the most difference. Success, failure, fame and infamy are all in God’s hand anyway and when God grants you wealth, it is a test of how good a custodian you are of it. In Hinduism we believe that there are six things over which we have no control: birth, death, success and failure, fame and infamy. When God’s breath is over your soul, over your being, little effort produces great results. Giving has many manifestations. You can give knowledge, you can give money, you can give food – or whatever you are able to. The taker should have an appreciation – if they are ungrateful, however, it’s their misfortune, not the giver’s. My foundation is small compared to others. The Chitra collection is named after my late wife and is an expression of gratitude for her life. To me, she was the greatest woman I’ve ever met and known, she gave me so much wisdom and made me who I am. In her memory, I am on a mission to protect a culture that is dying – tea culture has systematically been destroyed, or is on the verge of destruction. The Chitra Collection is also an attempt to protect a heritage that is 5000 years old – objects that represent the artistic endeavours and passion of their creators, but also tell the story of the individuals who commissioned them. And while many people collect paintings, for me, it was intuitive to collect and preserve rare tea-related artefacts. 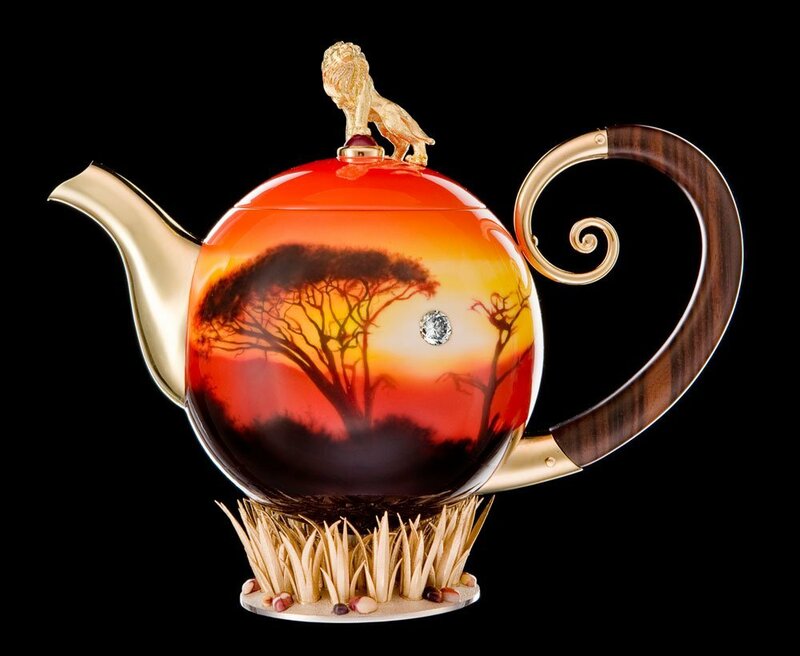 I thought, “I can’t match the Taj Mahal or the Bill Gates/Warren Buffet foundation, instead, I’ll start collecting teapots”. 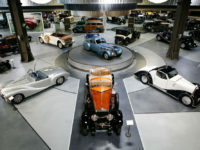 As legacies go, this is a decent size in that it is the largest collection of its kind under one roof. 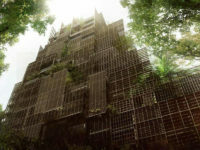 I hope the next custodian of it will preserve it for future generations. 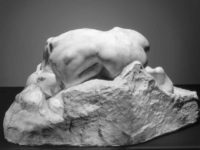 It is not easy to build this kind of collection because there are so many counterfeit pieces out there, made by increasingly sophisticated forgers and at the same time, there aren’t that many specialists capable of evaluating these objects. It is a disease of our age to stake a claim on a particular expertise without anything other than pretentious posturing to back this up. You are asking me to pick one out of 1700 babies. To name a few top pieces, we have a monkey pot which is German, circa 1600, and quite exquisite; the Nelson pot in which I take great pride because it was used by a person who, by the grace of God, achieved his goals and a number of pieces from the Napoleonic era. 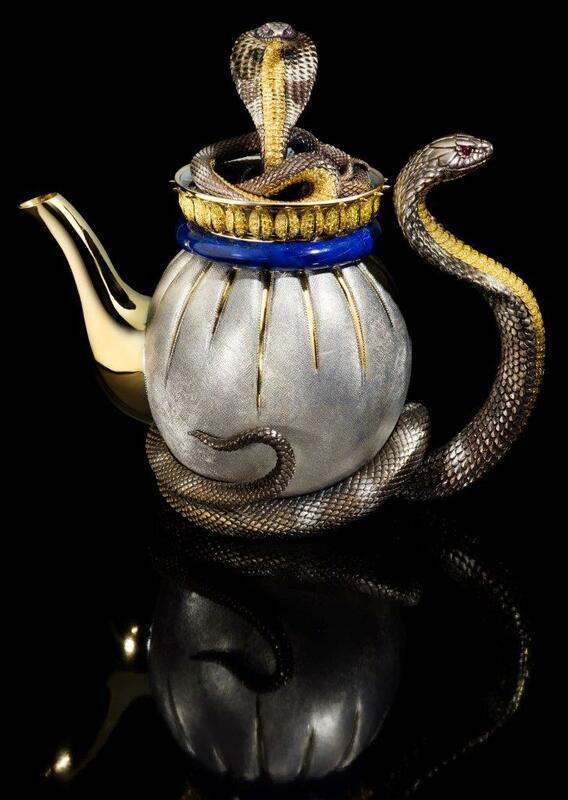 I also enjoy designing pots and one of my favourite is the “Cobra” pot, based on the Hindu mythology, guarded by a beautiful Cobra both at the top and at the handle. 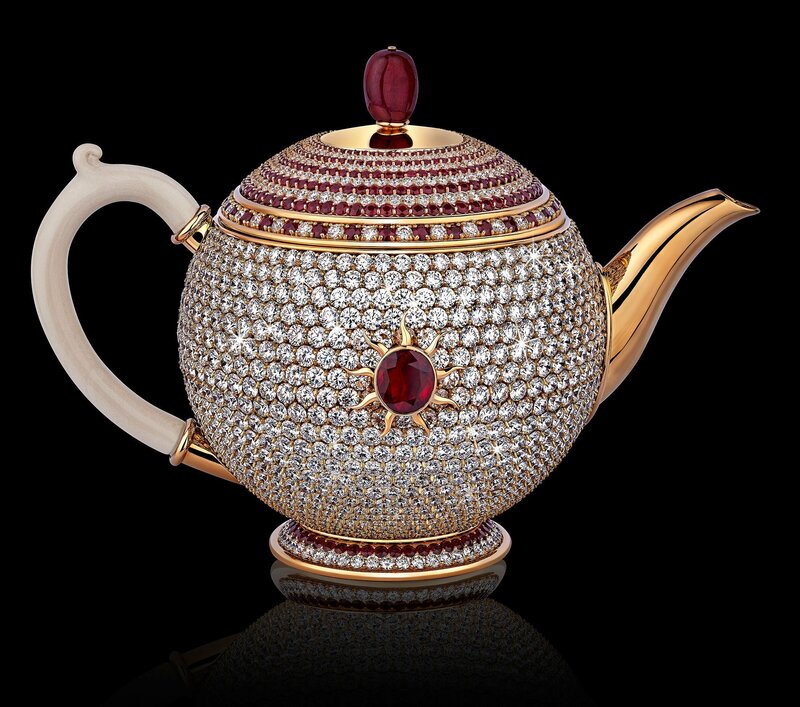 I designed the “Egoist”, too and this was awarded by the Guinness Book of Records as the most valuable teapot because it is incrusted with rubies and diamonds. It was designed to reflect the radiance of my late wife and is very close to my heart. It is one of 10 designs I’ve done so far. Many people ask how I can collect so many pieces of a single subject, specifically related to tea and coming from everywhere. I don’t know the answer, but we all choose our own path and each of us has to find a way of expressing gratitude for their good fortune or of paying homage to someone. Yes, a few rare textiles. I also collect tea experiences and have been known to create a unique container to store a special tea. Finding the perfect tea is exciting and rewarding. I think of the Chitra Collection as my mission – the name Chitra must live for as long as tea culture does. The most transformative thing that has happened in your life? My utmost gratitude is to my parents who created me; my second utmost gratitude is to my late wife who, in a very unique manner, brought me to what I believe in. My gratitude also goes to those people who hurt me, because after every hurtful action, every pain, there was something for me to learn, so that I don’t repeat the mistake. I strongly believe the past is the teacher of the present. Technology has also been very transformative and has a part to play but beyond technology there is intuition/a heightened sense of perception and finally, the divine will. There is this great difference between wisdom and knowledge. Technology can give you knowledge but not wisdom. Technology can help you but it has limitations in that it cannot create – we can. The Divine, your karmas, your actions, will impact your destiny – or your fate. This is what I believe – that and living life on my own terms. The Chitra Collection was on display at the LAPADA Art & Antiques Fair this year.